Goats, chickens and a llama oh my! I had a chance to visit our local farm last week with my son's class of curious two and three year-olds - little people who possessed the purest delight over the colorful and lively landscape, who had absolutely no fear of animals and no squeamish concern about germs, dirt and dung. Adorable. I love days like this. Can I also just say how charming it is that you add a little French to your titles? I'm always extra charmed. Fall is So delightful....I can never get enough of it. Loved the collage. Are you sure you weren't in Nebraska recently? :) It is a shame we cannot be more childlike in our interactions. Lovely images Catherine. 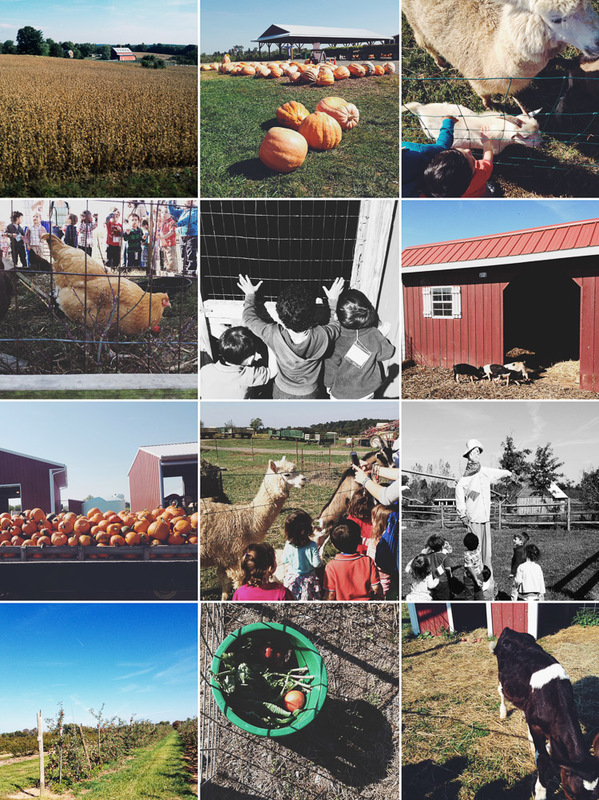 Looks like a lovely day--kids + farms = joy! what a fun day, super collage of it all! What fun for the little ones...and the adults too! What a fun adventure : ). I think Farms are so grand in the fall, aren't they? Great photos! Stopping by from Sweet Shot Tuesday. Yes, you've captured that child-like freshness and focus in your photos, Catherine. It looks like a perfect fall day to commune with the livestock!